The final instalment! 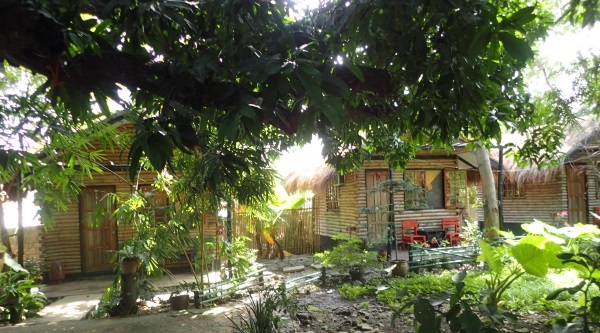 We arrived in Puerto Princesa around mid afternoon and checked into Subli, a property with five or six small cottages. The garden was lovely and much time was spent in the hammocks by most of us. 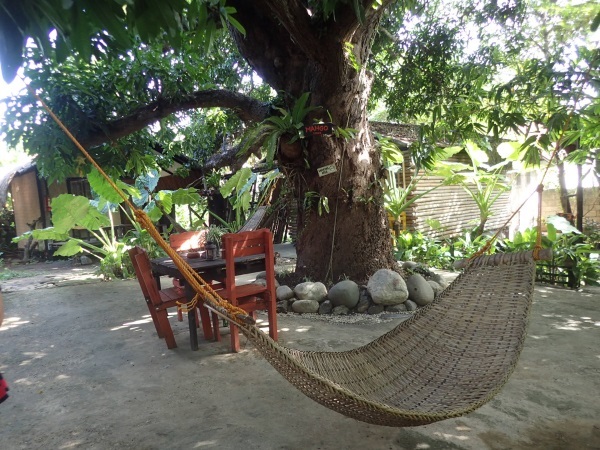 We spent a lot of time in the hammocks that were in the garden, at night they’d light mossie coils to keep the mosquitoes at bay. 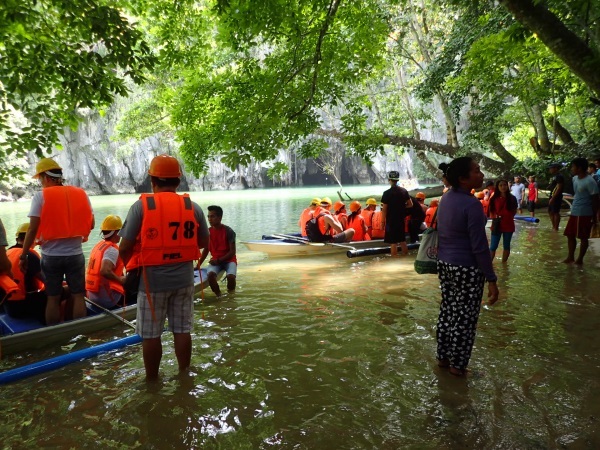 The main object of our stay in Puerto Princesa was a visit to the Subterranean River Cave. Tourism to the cave is massive. You must book a spot on a tour. A guide picks you up in a van (along with anyone else they can fit in), and then you go to the City Hall (with passports) and the guide takes all the passports in to make sure that who is on the tour is bona fide. Then there’s the drive – about 3 hours (it seemed like that anyway). We were earlier than our boat position (the 84th trip to go out on that day). ONLY 800 people are allowed to visit the cave each day! 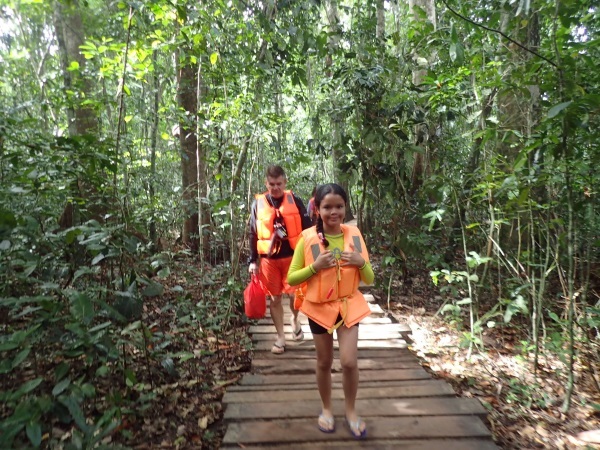 So, to kill time, we went on a tour through the mangroves, this is supposed to be sustainable tourism for the local village, which I guess it is, you are rowed up a creek and back again, looking at mangroves. Wasn’t all that exciting, but it did kill some time. Then we were taken to lunch (to kill more time), then we had to wait around until our trip number was called. Our group on the concrete “jetty” trying to load. It was actually interesting watching the boat captains and second officer (there’s only 2 people in charge of the boat), negotiating the swell to get the outrigger close enough for people to step over into the boat, I was very impressed watching 2 really old people (with walking sticks) and 2 blind people get on and off the outriggers! Here we are landing, we had gone out to sea and travelled for about 2k in quite a bit of swell let me tell you, hard getting off the boat in the waves. Our guide had put Jim on a different boat, here’s his group getting off, and the boats in the distance waiting to take customers back to the concrete jetty. 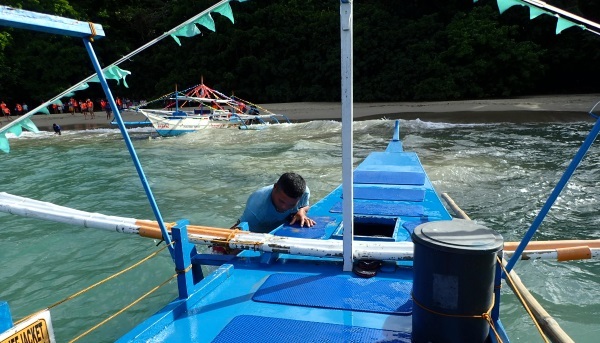 Then loaded in yet another boat, this time with a guide in the back paddling us. There is some graffiti in the cave to suggest the first visitors who left their mark were in the late 1920s. According to Jim, a SUSS group did quite a bit of exploration in the 1970s before the cave was opened for tourism. 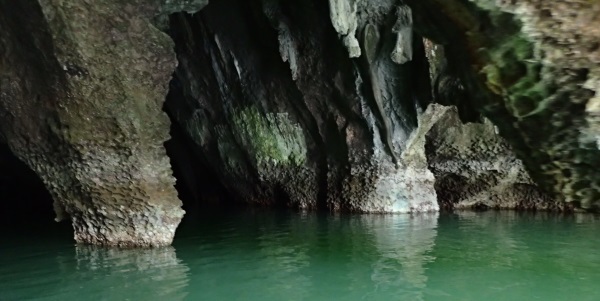 The river cave is about 24k long with an 8.2k section of river, the section we visited was only about 1.5k of cave. Apparently you can apply for a special permit (around P3,000) to go further but Jim and I didn’t know about this! My camera didn’t do the cave justice. 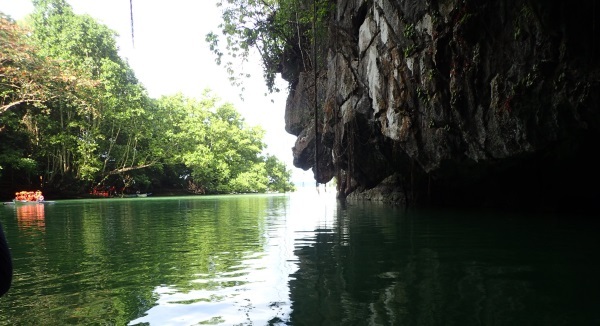 Most of the cave is primary formation, with only a few small limestone formations. Only the guides in the back of the boats had torches, so they highlighted what we saw as we listened to commentary via audio headsets. There were lots of bats in the cave, it would have been amazing at dusk to see them leave for the night. We walked back to the beach and it was time to leave, Jim was with us for the return journey which was fortuitous. 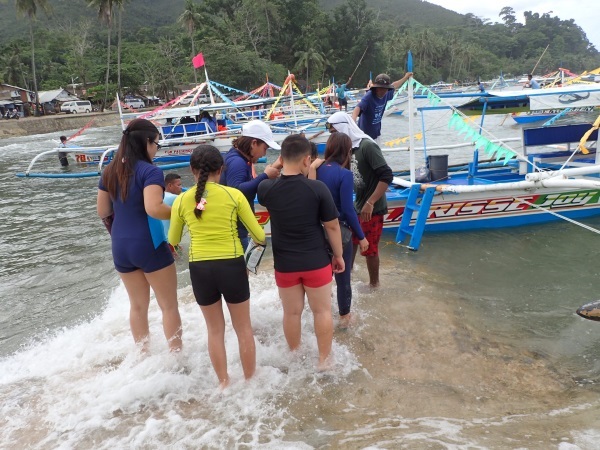 As we were leaving the beach a number of incidents happened. 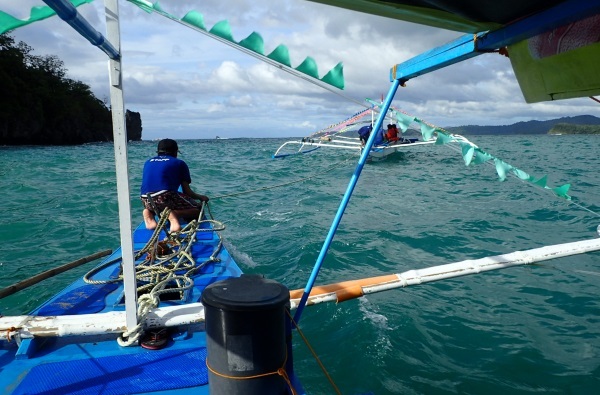 First, we were hit by another boat. 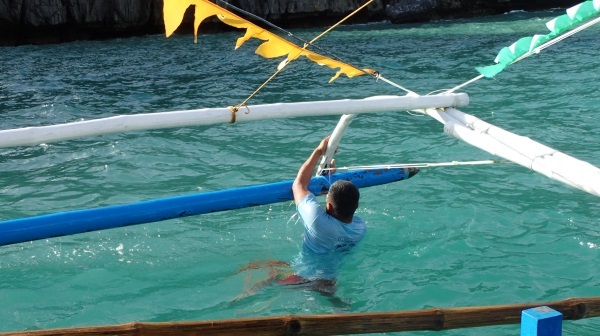 Then the second mate who was using the bamboo pole to get us out past the breakers fell overboard, maybe his pole got stuck in the water. 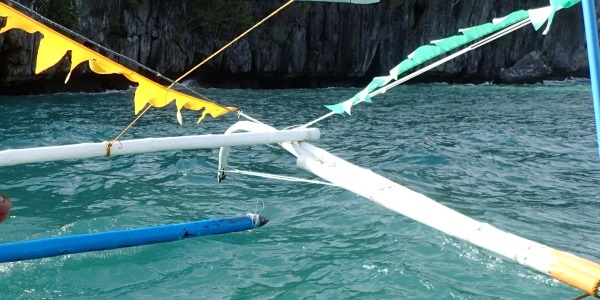 From the collision, one of our outriggers broke free of the horizontal bar, by now the second mate is back on board and still using the pole to get us further from shore. The captain was trying to start the engine, without success, appears that a wave had flooded the engine. 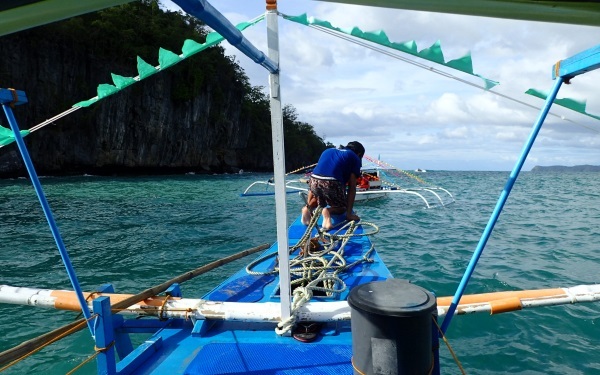 So while the captain is still trying to start the engine, when we were far enough from shore, the anchor was deployed (have to say I was happy about that, those cliffs were mighty close), then the second mate got in the water and fixed the outrigger with some heavy duty fishing line. I was happy about that too, I couldn’t see it being much use in the big waves. Still no luck with the engine, the captain then hailed another boat, which ignored us and sped by, so he hailed another one who agreed to tow us back to the jetty (that was going to be some long tow). We started the tow and then there was much scurrying around and knots were untied, this wasn’t looking good, but turned out it was just to give the tow boat more rope to work with. Still being towed and we’re getting out to the reef, I’m thinking at this time that our life jackets were really, really dodgy, I’d be ok swimming back to shore but Jim, the three kids and Fedz and her sisters might have issues! Thankfully, the captain went back and after a k or two (in a decent swell) got the engine going again and we hobbled back to the jetty under our own steam. I’d put the camera away before the engine got started, if I was going to swim anywhere I wanted a record of the drama on the high seas and didn’t want to lose my camera. 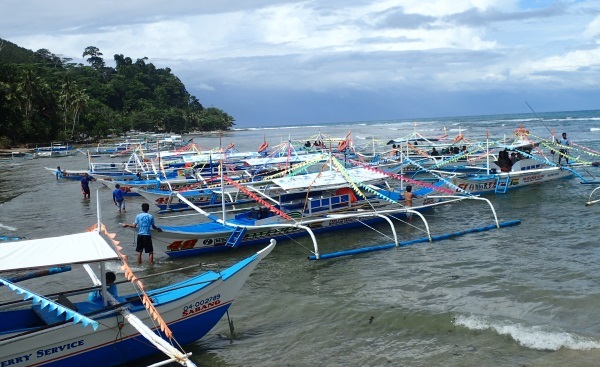 Fedz and I gave the crew a big tip (yes only P500 but a lot to them) for getting us all back to the jetty! 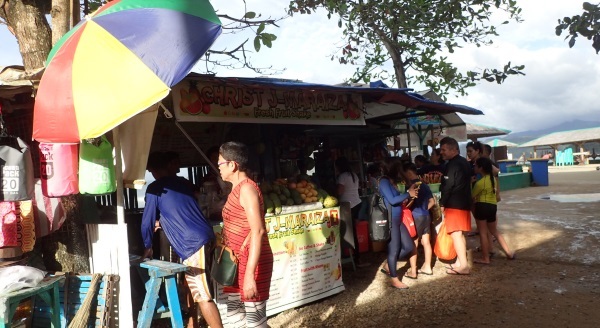 Back on dry land and we stopped to get drinks to celebrate our survival. 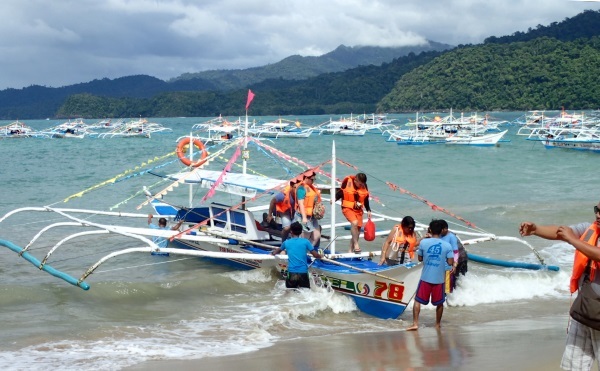 So, our Palawan holiday was coming to an end. 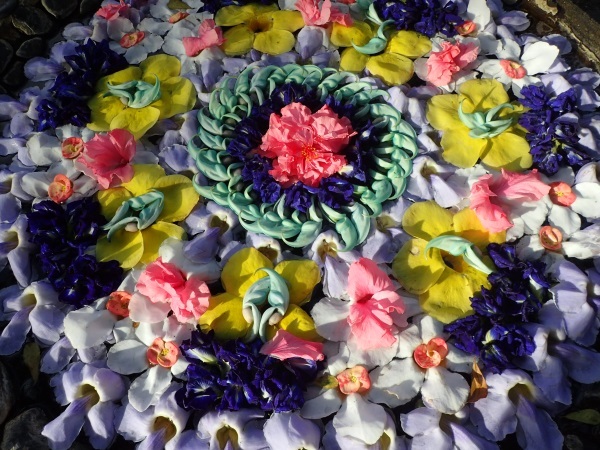 We took a tour around Puerto Princesa the next day and visited a place in the hills that had all these small bird baths that had flowers floating in them. They were everywhere and were the highlight of the day for me. I was booked on a flight out the next day at 6pm but Fedz thought that was too late, I might miss my connection, so I fronted up with the rest of them next morning at 6am and said I needed to get to Manila earlier than the flight I was on. Luckily someone didn’t turn up and I was able to go to Manila with Fedz/Jim and the others. And next thing I knew I was on the flight back to Sydney. It was a great trip, most of the time I didn’t know what was going to happen next, but I certainly got a feel for the Philippines – at least islands other than Luzon. 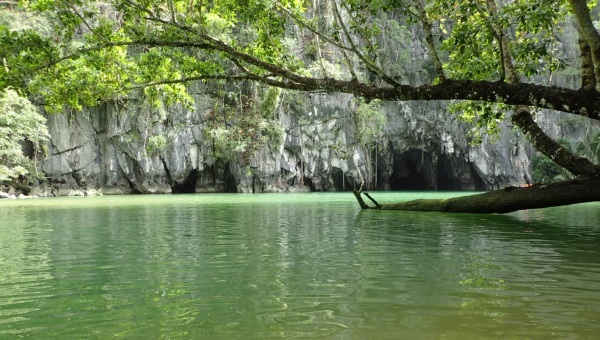 I plan to go back there in a couple of years, but I will mostly stay on the island of Samar and do some more caving. Hope I can convince someone to go with me! 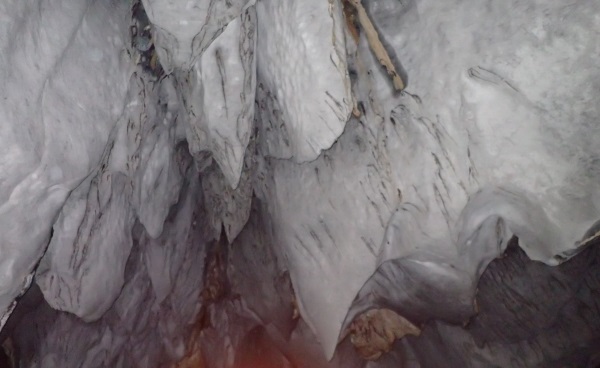 This entry was posted in Caving, MSS, Philippines. Bookmark the permalink. haha, I may yet get you into a cave! Love this, thank you for sharing, your pictures bring it to life. Wow, I’ve really enjoyed reading the whole saga! 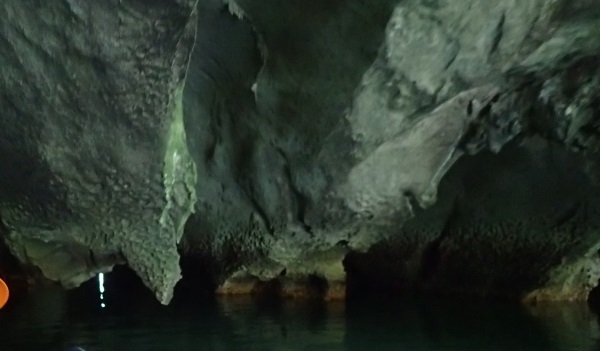 You certainly saw a lot of the Philippines, as well as the beautiful caves. Thank you for sharing all this. Thanks Trish, can I book you in for 2019?